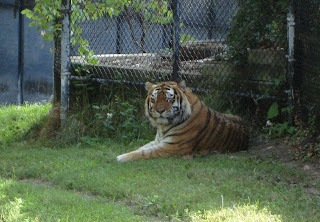 Murry a male Amur Tiger came to us in June from the Lake Superior Zoo in Duluth. After a mandatory 30 stay in quarantine to make sure he was free of any bugs or parasites that could be transferred to the zoo collection, he was moved to the Large Cat Building. After a few weeks of getting used to the building and his holding area, he was offered the chance to go on exhibit. The first few days he looked at the open door, but did not venture onto the exhibit. Finally on Wednesday he made his way outside, and as you can see from the picture, Murry looks quite content outside. Murry will be splitting his time on the exhibit with the female tiger, Pahstrel, until they are introduced later this year. For now, they are meeting through a mesh wall to get the scent and sight of eachother. Murry is a big guy, about 450 pounds, dwarfing petite Pahstrel by about 250 pounds! He has a mellow temperment, and we feel he will be a great addition to the cat house. Murry is being incorporated into Como Zoo's Operant Conditioning Training Program, and should learn the basics of training such as targets, paw presents, and shifting quite quickly.